The “Photography Olympics” (International Print Competition by the Professional Photographers of America) just completed this week in Atlanta, GA. This year, I was within 2 Merits of completing my “Master Artist” Degree, given by the Professional Photographers of America for excellence in Digital Artistry. 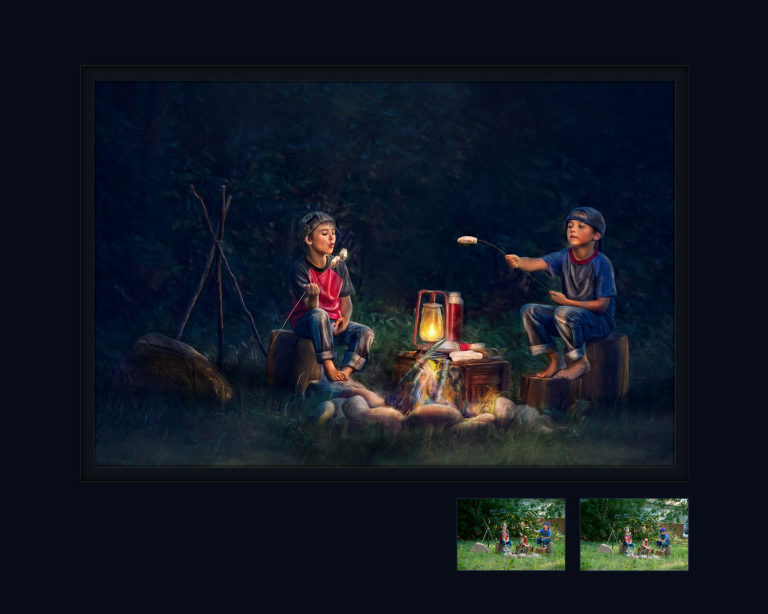 I submitted my 4 entrants, and although they didn’t reach the prestigious LOAN Collection as hoped, I did earn Merits on all FOUR images, earning a Bronze Medal. Thanks to all who served as advisors and mentors over the past 3 + years of creating these images. I look forward to celebrating them with you in Atlanta at the IPC Exhibition in January. In addition to the “Artist” category, I entered 4 images in the Photographic Open division, and also earned 4 Merits on my images. I’m very proud of both of my cases, especially knowing how few entrants even attempt 8 entries, and how even more rare it is for someone to Medal in both categories. I am also proud to say that this is my second year in a row to earn Merits/Loans on all 8 of my entered images. In 2017, I was one of only 21 photographers to achieve the 8 for 8 designation. 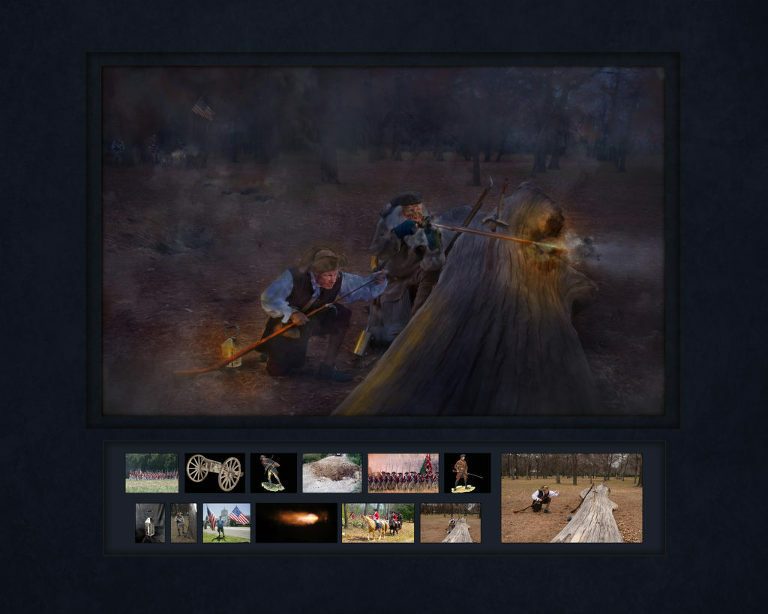 The images I entered are shown here, along with a brief description of what makes them a “Merit Award” winner. “Sledding with Santa” – 2018 IPC Artist Category Merit Award. This image features Santa Chuck Lee and our now famous Snowman “Wilbur”. The set was created for The Storybook Santa Experience” in 2017. I took a few minutes after our sessions to ask Santa to pose for a few images. You can see the reference image in the right hand margin. 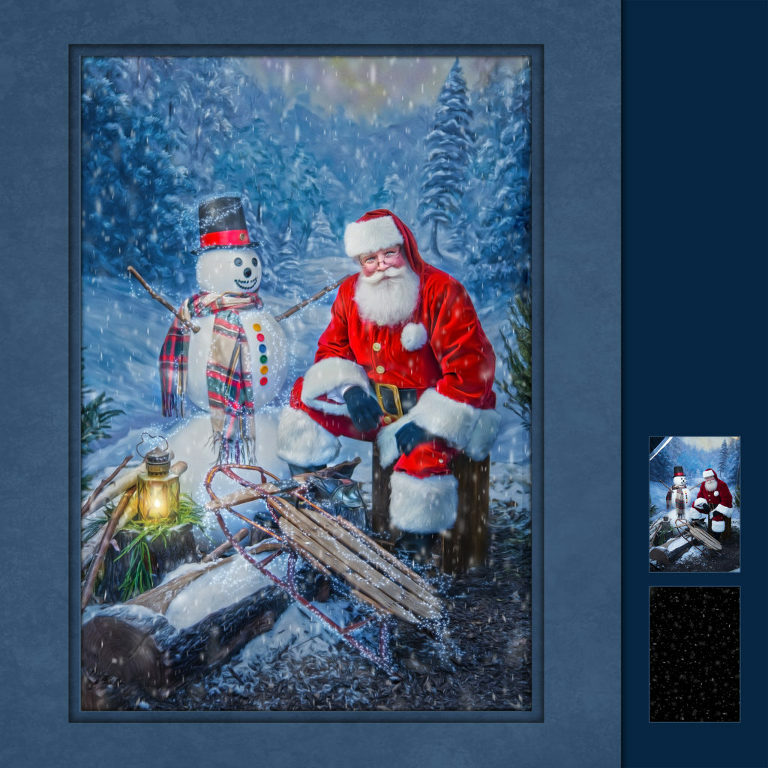 Notice the addition of the snow overlay, the hand finished paint strokes, the “magic” snow around Wilbur, and then the colorful finish to Santa’s coat. In addition, I removed the light box that was visible in the initial frame. The judges liked the composition, lighting, and storytelling of the image, along with the finish details like the lantern and the hand painted beard and fur on Santa’s coat. “American Legend” – 2018 IPC Artist Category Merit Award. This is a DC3 that operates out of the Midway Regional Airport in Midlothian. Last summer we had a high school senior who was going into the air national guard and asked for a photo with an airplane. I knew this one sits at the airport and I asked the owners for permission to photograph it. There are 33 different images used to make up the final exposure. Each part of the aircraft was lit independently for maximum effect and then layered together for the final image. 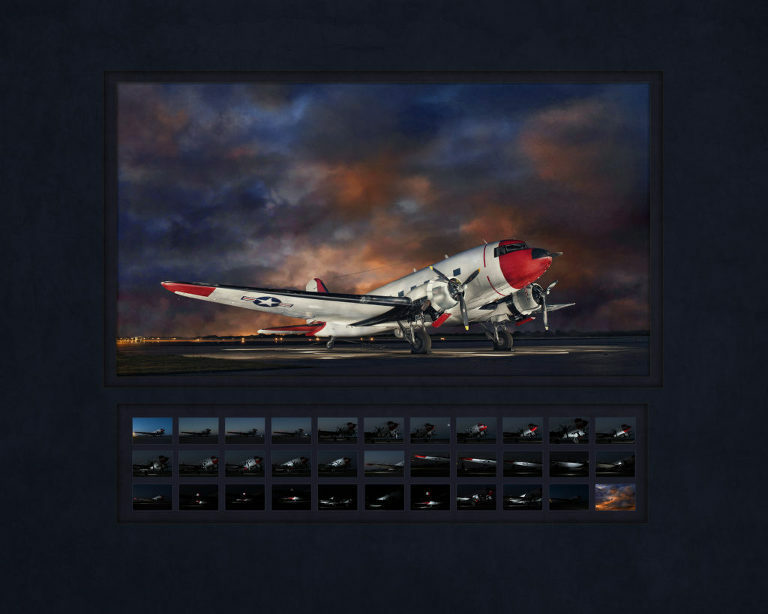 The overall was hand painted in Photoshop and a new sky was dropped in for dramatic effect. The process of photographing and creating the image took approximately 60 hours. “Freedom Fighters” – 2018 IPC Artist Category Merit Award. This image came as a result of learning that a local Santa Claus actor, “Santa Bill”, was also a post revolutionary war actor. When he told me he has a closet full of authentic clothing, guns and accessories, I knew what I wanted. We photographed this in the park near the Fort Worth Zoo. He played both the sniper and the loader in the scene, and you can see him posing in the reference photos. The rest was added in from elements found online and then finished with a smoky morning blue. “Fender Bender” – 2018 IPC Photographic Open Category Merit Award. This image is special to me because this is the third year in a row my son, Connor, posed for me in an image. He is an excellent guitarist, so this is a real slice of life for him. If I can’t find him playing video games, he’s usually sitting with his guitar and playing whatever song he heard last or whatever melody pops in his head. Shot in the studio. “Lonely, Seeking Relationship – Strings Attached” – 2018 IPC Photographic Open Category Merit Award. This was another personal project using my own guitar. I’m a new guitar collector, and this was a new addition to my set. It is a Taylor W65ce 12 String. The walnut is just stunning and I had to photograph it. This is actually 17 different exposures in one, layered together to enhance every detail of the guitar, from the gold tuning pegs, down to the ebony bridge and pins. Shot in studio. “Making Magic and Memories” – 2018 IPC Photographic Open Category Merit Award. Of course, no print competition case of mine is complete without a Santa Claus portrait. This is Everlee with Santa Jeff. She came to our Storybook Santa Experience in November of 2017. Her outfit was absolutely perfect for the outdoor snow scene. With a little paint and some magic from Santa, this piece earned a Merit Award. “Simple Swag” – 2018 IPC Photographic Open Category Merit Award. This is Jordan. He goes to school with my son and he was a part of a promotion we did for the Couture Kids line. I loved his pose and his expression and the finish is a mix of photoshop techniques designed to highlight the texture in his clothing and his skin tone.